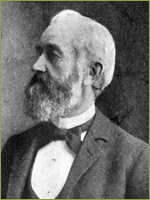 William M. Searby was born in 1835 in Lincolnshire, England, and showed an early interest in the practice of pharmacy. He passed the apprentices’ examination at age fifteen and earned his registration certificate as “Pharmaceutical Chemist” by the time he was twenty-one. After four years in the pharmacy business with his brother, he immigrated to British Columbia in 1860, settling briefly in Vancouver, and marrying Marie E. Pidwell. By 1865 Searby arrived in San Francisco and took a position in the Wakelee Pharmacy in downtown San Francisco. Within a year he went into business for himself, starting a string of popular downtown pharmacies under the name of the Union Drug Company. All of these stores were destroyed in the post-earthquake fire of 1906. During his career as an inventive businessman, William Searby remained well acquainted with physicians and their medical needs, and successfully marketed hair tonic, bitterless cascara preparations, and a well-designed bedpan. Throughout his business career William Searby also invested a large portion of his time and commitment to professional development in his chosen state of California, and became a leading figure in the development of the field of pharmacy in the western United States. He is credited as a major force in founding the California Pharmaceutical Society in 1869, and the California College of Pharmacy in 1872. He served on the first faculty as professor of materia medica, and by 1897 he was made professor of pharmacy, a position he held for the rest of his career. Colleagues described him as a “teacher of rare ability and great power,” whose teaching style “caused… dry and recondite studies to become of vital interest.” He also was dean of the college for many of the California College of Pharmacy’s early years, (1883-1885 and 1891 to 1909), and served continuously as secretary of the board of directors of the college, where he was a consistent advocate for raising requirements for admission and graduation. Throughout his influential career in California, William Searby promoted the “advancement of ethical pharmacy”, acting as an outspoken member of the State Board of Pharmacy, and he frequently addressed the state legislature on pharmaceutical legislation. In 1892 he became editor of the San Francisco and Pacific Coast Druggist, and in 1907 he served as editor in chief of the Pacific Pharmacist, a journal dedicated to the “cause of the higher and better in pharmacy...opposed to fakirs and fake remedies of all kinds.” He published widely in pharmacy journals, commenting on “Changes that I have Witnessed in the Drug Business during the last Forty Years,” and lending perspective on the transition from “old” to “modern” pharmacy. He served as president of the California Pharmaceutical Society in 1873, 1878, and 1885, and the reorganized California Pharmaceutical Association in 1907. In 1907 he was elected President of the American Pharmaceutical Association, a high honor for a pharmacist-educator in the Far West. William Searby died in 1909, at the age of seventy-four.